The pools and lagoons around Niue have the most shockingly crystal-clear water I’ve ever seen. It’s not unusual to have 100-feet visibility. And the colors are so dramatic you feel the fish swimming around you can’t be real. They must be plastic or something, like in the submarine ride at Disneyland. There are anemone and butterfly fish and Moorish idols and brightly colored wrasse—some with yellow tails, others with bands of blue or red. 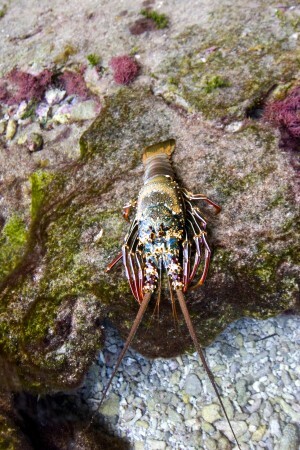 And even lobsters. Look at this guy. 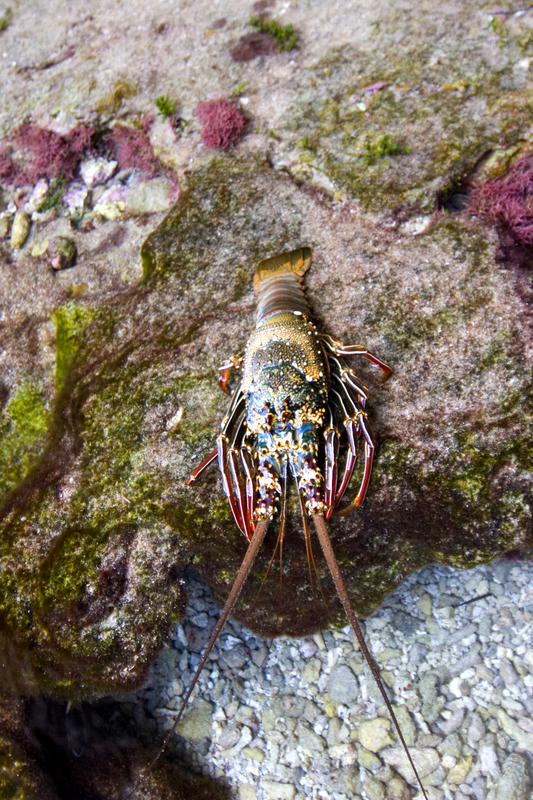 He moseyed over to me when I was standing in about two feet of water in the Avaiki pools. I don’t know if you can tell from this photo or not, but this sucker was big. Like maybe four or five pounds. I was tempted to reach down and grab him, bring him back to the Matavai and let Levu cook him up for my dinner. But it just didn’t seem right. I figured it would be like having Bambi walk up to you while you were hiking in the forest so you put a noose around his neck to lead him home and roast him. What fun is that? The other thing you notice about the water, besides how impossibly clear it is, is that it isn’t very salty. 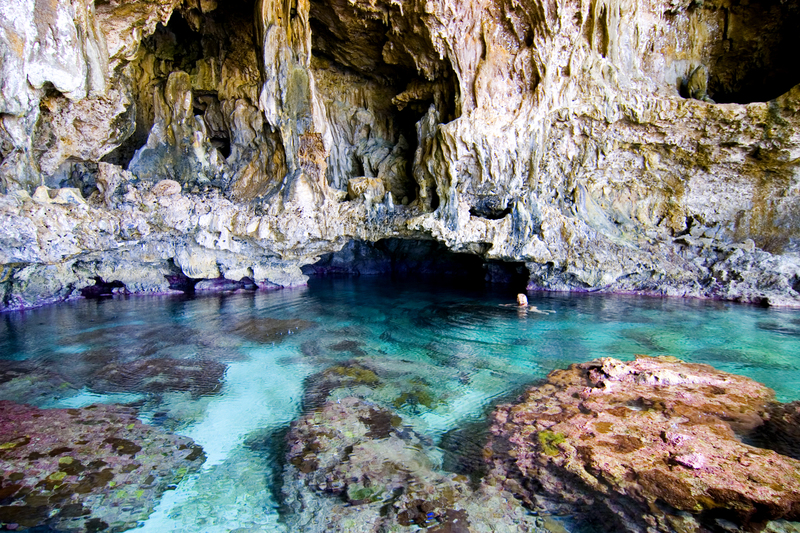 That’s because Niue is made up primarily of limestone, which is quite porous, and when it rains, the water literally disappears on contact, seeping straight down into the ground and then percolating into the sea at spots like the Avaiki pools. So the water here is a mixture of fresh and ocean water. This is true all over the island. You can actually see the fresh water pouring into the sea from the porous limestone rock. Yesterday I spent all afternoon at Avaiki where a large deep natural pool has etched its way into an open-mouthed cave, facing the sea, that is overhung with giant stalagmites. I swam back into one of the caves where the water was so clear and fresh that I felt like I was swimming in a resort pool. Like an exotic, but artificial, pool at Club Med or something. But then I let out a shout, just to hear the echo, and a hundred bats came swarming off the roof of the cave, scaring the hell out of me while making me realize just how real this environment is. If you look at this shot I took of one of the Avaiki caves I’m talking about, you’ll see what I mean. You’ll see all those intense colors—the turquoise pool, the purple rocks—and you’ll think, God, he must have Photoshopped the hell out of that. Nope. That’s just the way it is. Untouched (except for a slight increase in contrast). No filters, no special settings. Nothing. And the only other person that showed up during the two or three hours I was there was this Polish woman who was crewing on a sailboat moored offshore (which brings up an interesting point: As far as I can tell, I’m the only American on the island at the moment). While she was paddling around in the cave (I didn’t tell her about the bats), I explored the shoreline a bit to the south, walking through fairly shallow water, and found a private little beach—no more than 20 feet long—where I took a snooze. Which leads me to Rule Four on Niue: Pay attention to the tides. By the time I was ready to leave the sandy cove at Avaiki where I’d fallen asleep, the tide had come in over the outer reef. Which made it difficult to keep my camera dry while I dog-paddled back to the sea track. Not bats, probably cave martin a swallow-like bird. Only bats in Niue are fruit bats that live in the forest. … again, caught with the tide … from the coconut!